SOLID-STATE lighting, the latest idea to brighten up the world while saving the planet, promises illumination for a fraction of the energy used by incandescent or fluorescent bulbs. A win all round, then: lower electricity bills and...less climate-changing carbon dioxide belching from power stations. Well, no. Not if history is any guide. Solid-state lamps, which use souped-up versions of the light-emitting diodes that shine from the faces of digital clocks and flash irritatingly on the front panels of audio and video equipment, will indeed make lighting better. But precedent suggests that this will serve merely to increase the demand for light. The consequence may not be just more light for the same amount of energy, but an actual increase in energy consumption. Princeton's Uwe Reinhardt offers a thoughtful and thought-provoking perspective on economists' use of the concept of efficiency. I know that Uwe has used my Principles of Micro textbook in his introductory class. So his commentary on "modern textbooks" is, at least to some extent, directed at me. (In particular, I suspect he has chapters 7, 8, and 9 in mind.) Uwe also provides some useful links to handouts he gives to his class. This scatterplot is from Paul Krugman. x is the core inflation rate minus the unemployment rate. 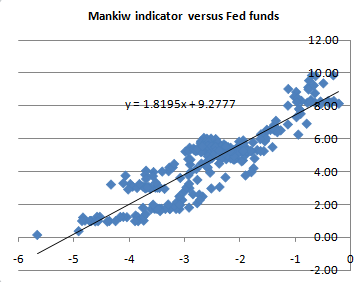 y is the federal funds rate. It uses data from 1988 to 2008. This graph is motivated by a version of the Taylor rule I once proposed. Paul uses a different sample than I did, so he gets slightly different parameter values. Nonetheless, I think Paul and I agree that this equation provides a reasonable first approximation to what the Fed will and should do in response to macroeconomic conditions. 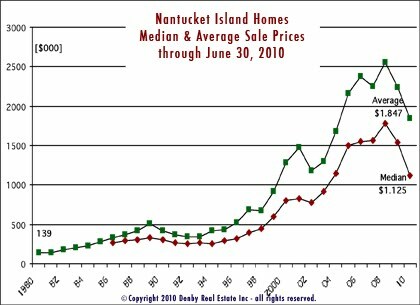 As is typical for me during this time of year, I have been on a field trip to study the economy of Nantucket. The chart below shows what I learned: This idyllic island has not escaped the rise and fall in housing prices that the rest of the nation has experienced. 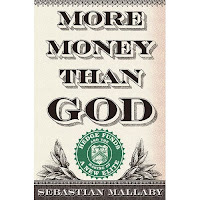 Sebastian Mallaby's history of hedge funds is well written, smart, and balanced. 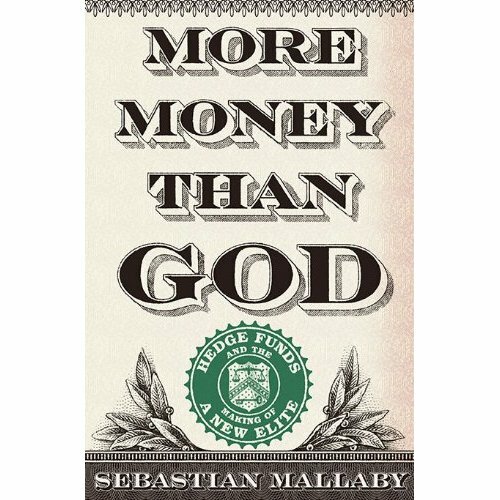 For econonerds, this is a good beach read. A tip for parents. My favorite family game: Quiddler. It is fun for all ages (as long as your kids have started to read), it doesn't go on forever (like Monopoly), and it is a bit educational (bring a dictionary along). The key insight of Keynesian economics is that the problem during recessions is inadequate aggregate demand. Taken to the extreme, which some Keynesians do, it says that aggregate demand is the only thing you need to worry about during downturns. Changes in aggregate supply (due to, say, high marginal tax rates or adverse incentives associated unemployment insurance) don't matter, they argue, because employment is being constrained by the low level of aggregate demand. University of Chicago economist Casey Mulligan offers a challenge to that view. Casey points out that there is a regular surge in teenage employment during the summer months because more teenagers are available to work (that is, the supply of their labor has increased). That is no surprise: It is normal supply and demand in action. But if aggregate demand were the main constraint on employment, this increase in supply should not translate into higher employment during deep recessions such as this one. But it does! 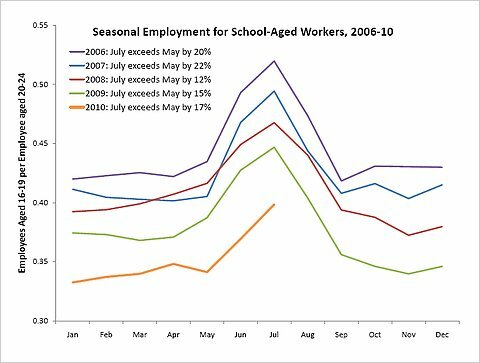 Most economists, Keynesians and otherwise, ignore this summer change in employment because we focus on seasonally adjusted data. But as Casey points out, the raw unadjusted data may have something important to teach us. Casey might want us to take this as evidence against the entire Keynesian worldview. I would not go quite that far, but it surely provides a challenge to extreme Keynesianism. I am reminded of a response I once gave to a reporter who asked whether I was a supply-sider or a Keynesian. "I am neither a supply-side economist nor a demand-side economist," I said. "I am a supply-and-demand economist." Chapter 2 of my favorite textbook describes how economists play a role in the making of public policy. If students want a more detailed description of the White House policy process, a good place to look is this recent post by Keith Hennessey. Administration officials can always be counted on to praise President Obama's health care law. But Rick Foster, the chief actuary of Medicare, offers an unvarnished assessment of how the new law affects 47 million Medicare recipients, as well as the federal deficit. "There is a strong likelihood that the cost projections in the new trustees report under current law understate the actual future cost that Medicare will face. A strong likelihood," he says. "I've gone so far as to say that I don't think it's a reasonable projection of what will really happen." Rick Foster made a rare public appearance at the American Enterprise Institute Friday to discuss the latest projections of Medicare which are required by law. The single greatest uncertainty in the projections are the cuts to Medicare that the administration is counting on to pay for new benefits.The Obama plan assumes health care can accomplish the same kinds of increased efficiency, or productivity improvements, usually seen on production lines -- like manufacturing cars. But few analysts believe that is possible. Joe Antos, a scholar at AEI, says, "they're productivity improvements if productivity happens. If productivity doesn't happen, they're still cuts." And Foster adds that, "every single expert we talked [to] has told us they did not think these productivity adjustments were viable. They thought they just would not work." Princeton's Paul Krugman plays offense. Brookings's Ted Gayer plays defense. CEA Chair Christy Romer is leaving the White House. From my own experience in that job, I know she must be experiencing mixed emotions. On the one hand, it is an exhilarating experience to be a member of a White House team, a part of history, and the leader of a staff of smart, hard-working economists at the CEA. On the other hand, in jobs like this, one loses a great deal of autonomy. People who choose academia as a career often do so because they enjoy the personal and intellectual freedom it offers. Having spent two years without it, I appreciate that freedom all the more. I bet Christy will feel the same, after she recovers from Beltway decompression. Are the Democratic-controlled Congress and President Obama very much pro union? Unquestionably. Do the economic effects of unions on the welfare of workers as a whole justify that union bias? No. Has their pro-union orientation seriously retarded the recovery from the recession? Probably....The real threat to a robust recovery on the labor side has come from employer and entrepreneurial fears that once the economic environment improves, a Democratic Congress and administration will pass pro-union and other pro-worker legislation that will raise the cost of doing business and cut profits. In this way the obvious pro-union-pro-worker bias of the present government has contributed to a slower recovery, especially in labor markets. Ken says we should focus on productivity and aggregate supply, not just aggregate demand.